It is the last quarter of the year. So we are trying to get as much content to you as possible. This month Joe Hummel will be presenting on functional programming. While this is not a new concept I believe it is one that most people have not been exposed to. I am really excited about having Joe bring us this topic. Please come out and join us. Microsoft Is Dead, Long Live SalesForce? A number of people returned from the recent Dreamforce conference. One told me that this is now the largest IT conference. This information was followed up with the statement that Microsoft is missing the boat and will soon go the way of Novell. This got me to thinking. Does this statement hold any water? Any large company definitely has the possibility getting tunnel vision. Microsoft is not immune to these issues. But is it possible that their culture might could as an anti-virus. There is one thing that Microsoft has shown that they can do well time after time. They may not be the first to the game, but they are very good at learning from what other companies invent. Can you say Office, Internet Explorer. They weren’t the first to have a word processor or browser, but that didn’t stop them dominating the market. Given their history I think there is a good chance that Microsoft will learn from any advantage SalesForce may have and eventually accelerate past them. Of course we will all have to watch and see. Matt Hidinger gave a high energy presentation around Onion Architecture for this month’s meeting. It was great seeing the history of this architectural approach including its connection to Jeffrey Palermo. Of course drinking from a fire hose takes a while to digest. Get the code and slides here. Please join us for our next meeting and get involved in the Chicago Information Architecture community. We are getting rolling for the fall at the Chicago IT Architects Group. This month we will have Matt Hidinger presenting on the topic of Onion Architecture. Please join us as we discuss the decomposition of architectures by registering below. A listbox can be a very boring display surface, but it doesn’t have to be. Ok, so it may never be exciting. At least we can create a more flexible output. The first element you need to learn about his the ItemTemplate which is in turn composed of a DataTemplate. As this combo implies it is bound to each item/data row. We will start organizing your base layout with a Grid control. Within the Grid you can add a RowDefintions group. A RowDefinition helps when you want components to be stacked for a particular data row. The main attribute for a RowDefinition is it’s Height. There is no name attribute, but we will get to that point toward the end of this article. The other main layout organization is kept in the ColumnDefinitions group. ColumnDefinition elements are best used for defining the width. I only created column definitions where they differ from full width of the row. In the case of this example the first of the two rows. Now that you have all of definition setup lets put it to use. 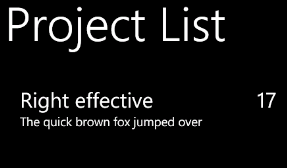 In this example we have a project list. Each project has a name, a score and a description. We will add a group of TextBlock controls for each data element. They do not need to be in any particular order and I will show why next. Now we can assign row and column associations to each TextBlock. Both rows and columns are assigned using a zero based index from the sequence they are defined in the XMAL. At this point the layout is set. The last thing we need to do is Databind the components of the list. Set the Text attribute of each TextBlock to an appropriate field of the object your are binding to each object. The final code is listed below. And here is what the result looks like. There is a lot more you can do with this approach by using other controls in your template, but this should give you the basic concepts you need.